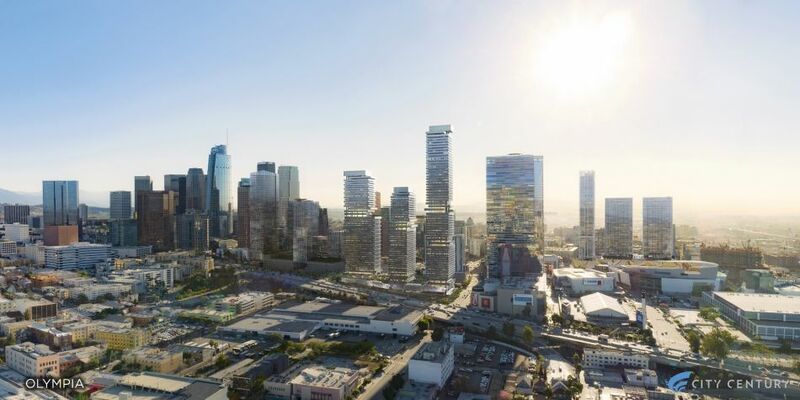 Architects Skidmore, Owings, & Merrill (SOM), P-A-T-T-E-R-N-S, and developer City Century have unveiled renderings for a trio of high-rise, mixed-use towers in Downtown Los Angeles’s bustling entertainment district. The newly-revealed mega-project is called Olympia and is billed to include 1,367 residential units, 40,000 square feet of retail space, and 115,000 square feet of open space. Those programmatic components will be distributed across a trio of towers rising 43-, 53-, and 65-stories in height that will be positioned over a 3.25-acre site at the intersection of Olympic Boulevard and Georgia Street. 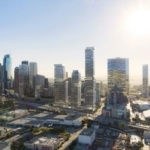 The project will be sandwiched between the L.A. Live sports and entertainment complex and the Gensler-designed Metropolis mega-development, a similar mixed-use project containing luxury housing and shopping amenities. 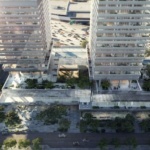 The Olympia project is being designed by SOM and P-A-T-T-E-R-N-S and will feature glass-clad residential floors with over-sized floor plates expressed across the facades of the rectilinear towers. Those floorplates shift in and out at various intervals and contain outdoor amenity spaces at various heights. The project is one of many luxury, mixed-use, high-rise complexes going up in the immediate area, with the aforementioned Metropolis project, the Harley Ellis Devereaux-designed Circa, and CallisonRTKL-designed Oceanwide Plaza projects being but a few of the developments currently in the works along the blocks immediately surrounding the L.A. Live complex. Developers for the project expect for the entitlement process to play out over the next 18 months with a four-year construction timeline to come afterward. 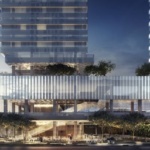 The developer has not announced whether the units will be for sale or rent.